So a few things. One is the image above. 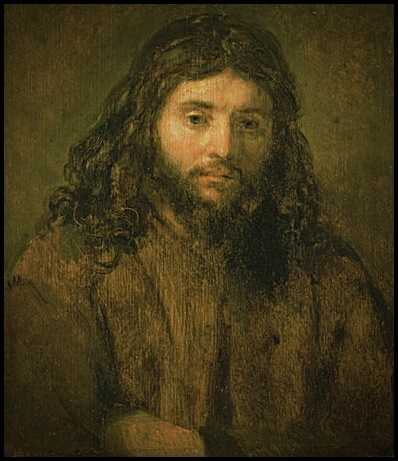 It is one of Rembrandt’s Faces of Jesus. This is one of eight in a series, I've read. I've also read that the artist only kept two of his own paintings in his bedroom, and this is one of them. He depicted Jesus wearing workman's clothing of the day. Beautiful. Moving. But what does this have to do with a dream that I dreamt, I'll talk about that in a minute. I also find it interesting that in this day if a person mentions that they are “spiritual” it can be considered cool, or if they say they are a Buddhist it doesn’t raise many eyebrows. But if they say they are a Christian they are often associated with the right wing (and I couldn't be the farthest thing from it). But this doesn't actually surprise me given the so many actions that people sometimes do. But to me Christianity is so deep and it's breadth so rich; to me it goes far deeper than the children's Sunday School stories that are still often taught to adults. To me Christianity is a movement of the heart, a way to live...it's a mystical religion. And while I really am fascinated by most of the major religions, Christianity is the one I was raised in and the one I am most comfortable with. A few years ago I was fortunate enough to see the Dalai Lama speak and one of the things he said (and I'm paraphrasing) was to stay with the religion of your birth, that they all speak the same truth. He went on to say that if you don't see it simply look deeper and you will find it. With this said I have—as an adult—often struggled with who Jesus actually was/is. I won't expound too much on this at this point—because I could go on for many boring pages—but I will just add that the original Christianity was all inclusive, not exclusive. It was, and still is, about changing ones heart and mind—looking inward then reaching outward—to connect with God and your fellow human, which are one in the same. On a bit of a side note, one of the original definitions of the sometimes scary word "repent" was to “turn around” or more loosely, to have a change of heart and look at life differently, more compassionately. But a compassionate mystic is difficult to control, thus the reason for the invention of hell, damnation, and needed salvation (which is all an invention of the early church in my opinion). Oh geeze, sorry, off on a crazy tangent. Maybe my current week-long summer respiratory/head cold (which is on it's last leg) and the fact that I'm sitting in a cafe having a beer has lead me to this point. Anyhow, I digress. I'll finish this brief section with this...I call myself a Christian in that I attempt to follow the teachings of Jesus, the son of Joseph from Nazareth, the best that I can (of which I usually fail miserably each day but tomorrow is a new day for improvement). I don't believe in hell, damnation, or any of that scary stuff...it's all metaphor and it's all Good (yes, the “g” in good is consciously capitalized). But, before I finally get to my dream that I dreamt, I have to offer this disclaimer that I usually do when I write about my beliefs...if you are a literalist or someone who takes the Sunday School stories as truth, that's fine, but if you are feeling the need to save my soul or send me hate mail please don't as I am just fine. Thank you. Now here's my dream (finally). Like everyone, I suppose, I've had intense realer-than-real dreams a few times in my life—to the point that they seem prophetic (one which I had some years ago was, I'm convinced, a vision of sorts, but is too personal to share here or anywhere; it was just for me). And why do I write about this? I'm not sure; it just needs to come out. Anyhow, here it is. I “awaken” into the dream standing on the edge of a small crowd of people. We are outside, maybe in a garden or low-growing orchard; there' a stone wall to the right. And sort of in front of the crowd is a man carrying a sign; it's a portrait, maybe a painting. I didn't initially recognize the portrait the man was carrying but the look in his eyes (on the portrait, not the man carrying it) was compassion. So much love and compassion. I ached, that's the only way I can describe it. Though that is not accurate enough. The man that was carrying this portrait was saying something but I couldn't hear him. And at one point he turns his back to the crowd and looks at me. Our eye's lock and he's still talking but I still can't hear him, or maybe I just don't understand. We seem to recognize each other but I'm not sure from where. Then he turns to face the crowd again. And now, with his back to me, I hear him (which I thought was odd). And he's saying..."This is Yeshua. No matter what your beliefs they are not right or not wrong. Know what's in your heart. Yeshua's life is his message." And then it occurred to me that the image he was carrying was that of Jesus (Yeshua, of course, is his name in Aramaic). And then the man that was speaking and carrying the image of Jesus, who still had his back to me, simply said, “Know the truth.” and with that he turned around and faced me again. And this time when I looked at him I could see that the person holding the sign and speaking was in fact me. And with that I awoke with a start, gasping—slightly—for air, from the summer upper respiratory cold, but also from the dream I just dreamt.